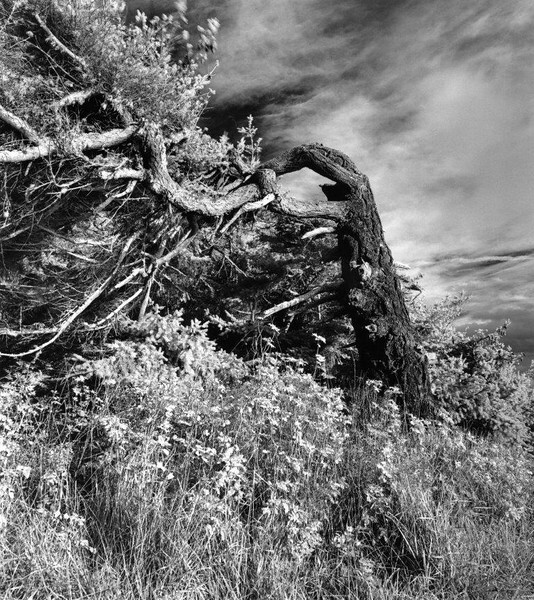 The photos in this gallery signify an effort to pay more systematic attention to the scenic delights of Whidbey Island. Since late in 2008 I have explored the use of an infrared film marketed by Rollei of Germany that seems to be particularly suited to the subdued lighting in the Puget Sound area. At the same time I continued to shoot my customary Kodak TriX in side-by-side comparisons, or at least on alternating outings. There's also a smattering of "paper negatives" and "paper positives." Because the resultant images come from two films, two papers and four camera formats (35 mm, 6x6 cm, 4”x5” and 8"x10" cameras) I have included more process notes in the image captions. This work continues as weather and inspiration come together. The location and shooting details are in the captions. Here I'm trying Rollei infrared film with Rodinal "stand" development. This is toning down the harshness of the i.r. film, while improving organic highlights compared to regular film. Nov 2016 with 40mm lens on Hasselblad.